Westmead Hospital nurses Robbie Cruceanu and Isabelle Trethowan with our patient Lidia Hall. Robbie and Isabelle are getting married in November. 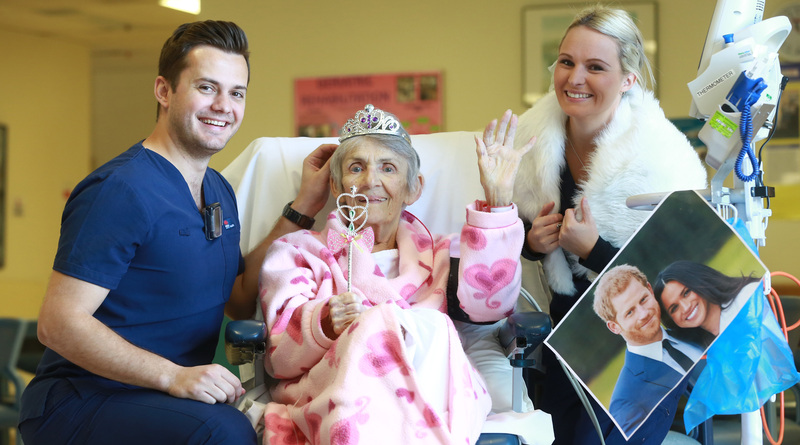 All patients at Westmead Hospital receive the royal treatment but today, Lidia Hall was pampered like a real princess. Ms Hall was brought to Westmead Hospital after experiencing a stroke last Friday. It was a miracle her sons were on hand to call an ambulance as she had been home alone when she was found on the floor. “I am feeling better now. It looks like I’ll be here for another week,” Ms Hall said. “I’m hoping I’ll be let out just in time for my daughter’s 60th birthday. Linda Hall loved the royal treatment and said it boosted her mood. Ms Hall said she was very much looking forward to the royal wedding. “I hope I can watch the whole wedding here in hospital tomorrow,” Ms Hall said. A sweet kiss by Princess Lidia for nurse Robbie. ← Why are our wards pink today?